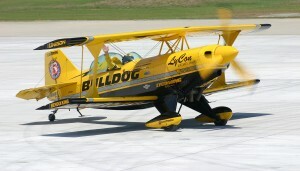 Jim LeRoy, next to his heavily modified Pitts biplane, Bulldog, perished during a July crash at a Dayton, Ohio air show. During their prime, Jim LeRoy, Jimmy Franklin and Bobby Younkin were three of the finest aerobatic pilots in the world, billing themselves as “The Masters of Disaster.” Their daring name echoes with tragic finality in the death of the team’s last living member, world-renowned aerobatic pilot Jim LeRoy, in a crash on July 28 in Dayton, Ohio. The accident follows the deaths of Franklin and Younkin in a 2005 collision. Although LeRoy was also flying during their performance, he was left unscathed. As the pilot behind Bulldog Airshows, LeRoy was a highly respected aerobatic pilot and a faithful performer at air shows all across the country. He will be remembered as one of only 11 pilots to be awarded both the Art Scholl Showmanship Award (2002) and the Bill Barber Award for Showmanship (2003), two of the aviation community’s highest honors. LeRoy’s crash occurred at the Vectren Dayton Air Show at the Dayton International Airport (DAY) during a dazzling Saturday afternoon. LeRoy and partner Skip Stewart were flying a specialty performance called “Codename: Mary’s Lamb.” The show included two aircraft, a jet truck and ground pyrotechnics performed to a theatrical soundtrack. Both men were members of the X-Team aerobatic group, which described the show on its website. LeRoy was flying his heavily modified stock Pitts S2S, Bulldog, with Stewart in another Pitts, flying in juxtaposition. LeRoy was reportedly performing a signature maneuver called “Skip’s Revenge,” which involved both planes performing a “half Cuban 8,” a loop in the air with a series of snap rolls on the way down. 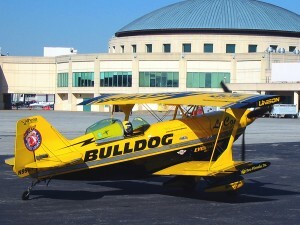 Witnesses say LeRoy recovered too late, and at 2:38 p.m., Bulldog struck the runway at more than 200 mph. Stewart landed safely a few minutes later. LeRoy’s plane skidded for some distance and briefly caught fire before emergency crews extinguished the flames at 2:41 p.m. First responders were on the scene within minutes. The pilot was cut from the plane and moved to a Black Hawk helicopter, which transported him to Miami Valley Hospital. Dr. Jim Brown, of the Wright State University School of Medicine, was onboard, but the pilot was pronounced dead before the helicopter reached the hospital. The coroner’s report states that LeRoy died on impact. “It’s a very, very sad day for all of us,” announcer Rob Reider told the crowd. Jim LeRoy waves to the crowd from the cockpit of his Pitts S2S. He was known for his passionate and articulate air show performances. The National Transportation Safety Board’s final investigation report is expected to take nine to 15 months to complete, although initial findings could come sooner. LeRoy’s sudden passing took the breath out of the aviation community, which cherished both him and his late partners. The U.S. Air Force Thunderbirds canceled their performance that Saturday but resumed performances the following day. Although the air show continued the day after the crash, the incident gave pause to even the most experienced aviation veterans. Stewart performed in his Pitts biplane during a touching salute the day following the crash. LeRoy was very articulate about his art and understood the risks and skill needed to control his aircraft. It’s obvious that LeRoy’s life was quite a ride. 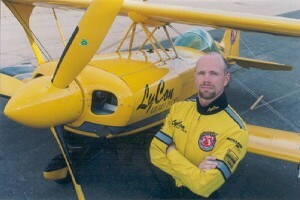 LeRoy was born in 1961 in Missoula, Mont., to a family that well understood the pleasures of aviation. A third-generation pilot, he was introduced to flying early on. After graduating in 1979 from Elgin High School in Elgin, Ill., he immediately enlisted in the Marine Corp, where he was trained as a scout/sniper and served with the 1st Battalion, 5th Marine Regiment. During his service, LeRoy earned his instrument rating, commercial license and flight instructor’s rating through the Marine Corps Flying Club located at Marine Corps Air Base Camp Pendleton in Southern California. He began working as a flight instructor at the club, giving checkouts and primary instruction during his off hours. In 1982, Sergeant LeRoy became interested in aerobatics, taking his first training flights with Chuck Wentworth at Art Scholl Aviation in Rialto, Calif. He received an honorable discharge in 1985 and left the Marine Corps to attend the University of Illinois at Champaign, where he majored in aeronautical engineering with a focus in flight control and propulsion. After earning his degree, Leroy worked for GE Aircraft Engines as a design engineer and later took on an even more vital role as plant manager for a power plant in Northern California. In 1992, the pilot got serious about his aerobatic work, purchasing a Super Decathalon and joining a local chapter of the International Aerobatics Club. That year, he competed in the sportsman class and moved up to the advanced category in 1994. In 1995, LeRoy flew his first air show as a performer in Corning, Calif. In 1997, he retired from the power plant business to dedicate his time to flying nearly 30 air shows per year. For a few months, he did provide some aerobatic instruction and engineering consulting services to make ends meet. During the winter of 1998, he even bought a dump truck and started hauling gravel and asphalt to pay for his flying time. A former Marine Corps sniper and aeronautical engineer, Jim LeRoy had retired in 1997 to fly air shows fulltime in his boldly painted Pitts biplane. 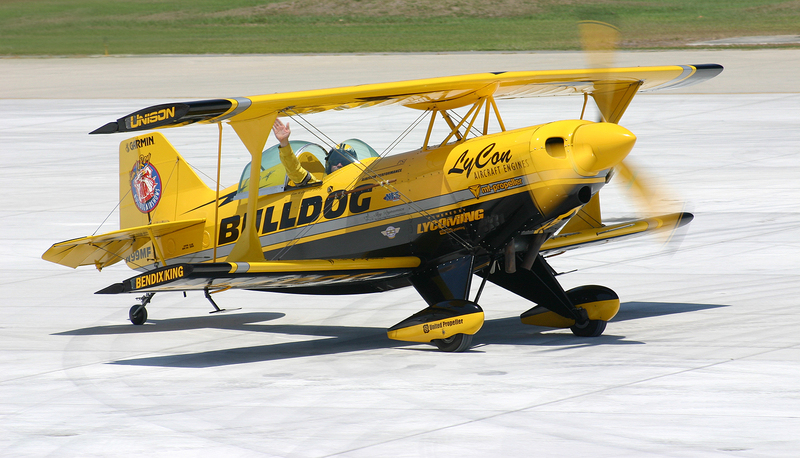 By 2000, though, his business, now named Bulldog Airshows, had taken wing, largely due to LeRoy’s intense performances and the popularity of the S2S Pitts he named Bulldog. Outfitted with a Lycoming AEIO-540-D4A5 modified 400-hp engine, the aircraft could reach speeds of up to 250 mph. LeRoy and other parties had drastically altered it with stronger spars, longer ailerons, a reinforced fuselage and other modifications that turned the old biplane into a high-performance aircraft. Other improvements included an oversized composite propeller, larger control surfaces, special fuel and oil systems, a re-shaped tail and a strengthened fuselage. “We took an already excellent aircraft and turned it into something very special,” LeRoy had said of the plane. He was even known to keep an official mascot named Opus—naturally, an English bulldog. LeRoy joked that the dog had to be grounded because he flew too close to fire hydrants. LeRoy’s skills had increased so much that just a few years later, he won the air-show community’s highest honors. In July 2005, he narrowly escaped death when Younkin and Franklin collided during a performance at the Saskatchewan Centennial Air Show in Moose Jaw, Canada. Though he was acutely aware of the risks involved in his career, he continued flying air-show performances after the incident. At the time of his death, LeRoy held single-engine, multi-engine, instruction, helicopter, helicopter instruction, instrument instruction and aerobatic competency evaluation ratings. This year marked the pilot’s 14th season as an air-show performer. A memorial service and celebration of LeRoy’s life was held on August 8 at the DuPage County Airport (DPA) in Chicago. A scholarship fund was established for LeRoy’s 4-year-old son, Tommy LeRoy. Contributions may be directed to the Jim LeRoy Jr. Memorial Fund, in care of Harris Bank, 110 E. Irving Park Road, Roselle, IL 60172.